The George Rodrigue Foundation of the Arts invites you to join Wendy Rodrigue’s Life & Legacy Tour at one of several events in September. Wendy began this statewide initiative last year as a way to connect Louisiana students with the art of George Rodrigue in a personal, intimate way. This fall, she is extending the tour to include presentations and talks for the general public as well. 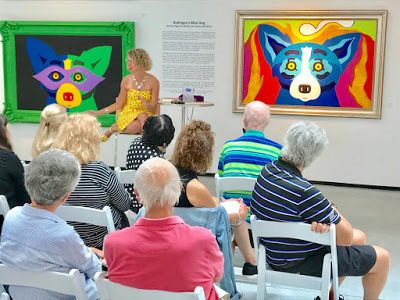 Wendy Rodrigue giving a public lecture this summer at the Ohr-O’Keefe Museum of Art in Biloxi, where a solo exhibition of George Rodrigue’s work is on view through October 6, 2018. To read more about Wendy Rodrigue’s “Life and Legacy Tour” and the inspiration behind it, visitMusings of an Artist’s Wife.